You can use MPF to control existing Williams / Bally / Midway WPC, WPC-S, and WPC-95 pinball machines. The main options for pinball controller hardware is the Multimorphic P-ROC (not the P3-ROC). FAST has a WPC controller too but it never hit general availability. The people who created the LISY boards are also working on a “LISY35” board for Bally/WPC machines with AS-2518-17 or AS-2518-35 CPU boards. In both cases, you remove the existing MPU board from the backbox of your machine and replace it with the new controller. You then connect up all the existing cables and connectors to the new controller, so in effect the P-ROC or FAST WPC controller becomes the new MPU of your machine. Switch connectors are connected directly to the P-ROC or FAST WPC controller. Drivers, coils, lamps, and GI are controlled via the existing WPC power driver board (which is connected to the P-ROC or FAST WPC controller via the existing 34-pin ribbon cable). The existing WPC sound board in the backbox is not used, as sounds are generated via the computer running MPF. There are articles online showing how you can modify the existing sound board to add a headphone plug you can connect into the computer running MPF, though most people end up replacing the speakers with new ones and a more powerful and better sounding amp. This means you can remove the existing sound board from the backbox. The existing DMD, if you choose to use it, is unplugged from the WPC DMD driver board and instead plugged into a 14-pin header on the P-ROC or FAST WPC controller. This means you can remove the existing DMD driver board from the backbox. For the P-Roc connect your machine according to the P-Roc connector mappings. More technical information can be found in the PinWiki Williams WPC page. In order to use MPF in a WPC machine, you need to configure the driverboards: section of your hardware: config for MPF. Note that with the P-ROC, it is very important that you specify driverboards: wpc in your config if you’re using a WPC machine. The reason for this is the P-ROC can be used to control either PD-16 (the P-ROC driver boards) or WPC driver boards, but the polarity of each type is the inverse of the other. In other words, if you put a P-ROC in a WPC machine but specify driverboards: pdb, when you run MPF, it will disable all the drivers, but since the polarity is reversed, it will actually enable every driver in your machine at once. This will (1) be very loud and cause you to jump back about 10 feet, and (2) blow all your fuses. Note that the “S” is not case-sensitive. Switch numbers in WPC machines correspond to the column and row, so switch “11” is column 1, row 1, switch “26” is column 2, row 6, etc. This means that there are no 0s or 9s in a standard 8x8 switch matrix. Also, some WPC-95 machines have a 9th column in the switch matrix (meaning they’ll have switch numbers 91-98). In this case, just enter those switch numbers like normal, and MPF will notice that there are switch numbers in the 90s and automatically configure the controller hardware to use the 9th column. Our experience with using MPF with many different WPC machines is that many times, the switch numbers in the operator’s manual are incorrect. (We see this in many 25% of WPC machines.) Usually it’s the case where two switches have been swapped, though sometimes there are unused switches that really are used and vice-versa. So if you don’t get switch activities that you expect, check out neighboring switches to see if the numbers are wrong. Fliptronics switches (on machines that have them) are entered with the SF prefix. There are 8 Fliptronics switches on machines with Fliptronics. Typically four of them are used for flipper buttons, and four are used for EOS switches. (The flipper buttons on most Fliptronics machines actually have two switches stacked together behind each flipper button. If you push the flipper button part way in, the switch connected to the lower flipper engages, and if you push the button the rest of the way in, the switch connected to the upper flipper engages. 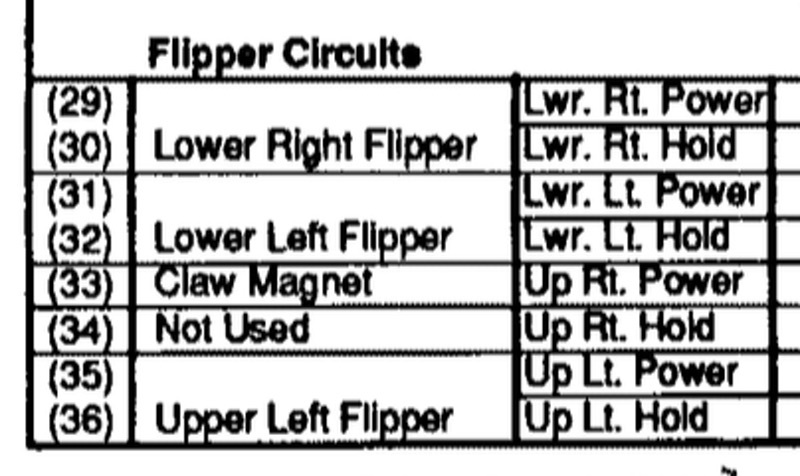 This means if you’re good, it’s technically possible to flip just the lower flipper without flipping the upper one (or it’s possible to hold a ball on the lower flipper while flipping the upper one). That said, some machines needed a few extra switches for other things, and if they don’t have four flippers, it’s possible that the extra Fliptronics switches are used for other things. The drivers section of your WPC machine’s operators manual will list all the driver numbers as well as the devices they’re attached to. Note that WPC machines use drivers for coils, motors, and flashers. You only enter your coils and motors in the coils: section of your config. Flashers go in the flashers: section (discussed below). That section shows the 8 driver outputs that are connected to the Fliptronics board (if your machine has one). Many machines do not use all eight of these, and many machines also connect Fliptronics coils up to other random things (typically magnets and diverters). See lights: and light_player: for details on how to use them. Since flashers in WPC machines are technically drivers (coils), they are also configured with the letter C followed by their number similar to coils. See flashers: for details on how to use flashers.